The beginning of the Omer period is marked by mourning customs, born from innate human anxiety about springtime grain production: will food production provide enough to sustain us or will weather aberrations ruin our crops? Notice the verse does not say the water was divided, but the waters were divided. This teaches that all the waters that were in all the fountains and wells, and every other place were divided. Question: Regarding God’s hand on Moses, explain it as a sign of loyalty. If God was annoyed with Moses in Exodus 14:15 when God said “Why are you crying out to me? Tell the Israelites to go”, where did the annoyance go? What does the division of all the waters symbolize to you? Climate scientists raise food issues as a serious concern. One billion people today obtain their only protein from the oceans. 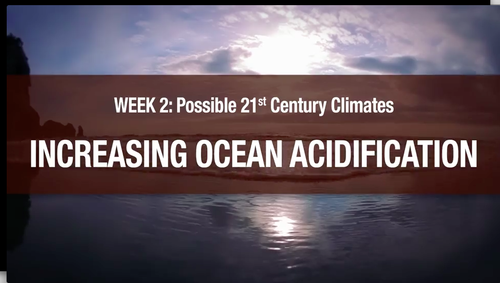 Much of our CO2 emissions land in the oceans causing them to become more acidic. The change in acidity prevents some sea creatures from forming properly. For fish and other sea life, ocean acidification prevents their eggs from surviving, and diminishes their ability to sense predators. Oceans also absorbed more than 90% of the additional heat caused by CO2 emissions. In warmer water fish need more oxygen to remain active, so fish size is expected to decline.Both warming and acidification mean coral reefs will decline. Reefs provide habitats for ocean fish that feed humanity. With human population expected to hit 9 billion by 2050, loss of oceanic food production can put extra pressure on our production of grains from agriculture. Question: Is God annoyed with us that we have sullied the planet? Are you annoyed? Action: Transform annoyance over emissions and climate change into actions based on the purest loyalty and love for the planet, oceans, and humanity. What reality-based (non-magical) action would you take if God’s hand were on yours? Since God isn’t visibly at your side, join a local group working on climate change. Working with others will feel like God’s power.